I wanted to write briefly about one thought I had about that time. (By the way, without sharing any personal details, the other staff who prayed for folks said they heard the “failure” theme over and over… and when I helped with this training a year ago, the same topic dominated the prayer requests). The primary issue is spiritual. We know we have an adversary that seeks to discourage and destroy. 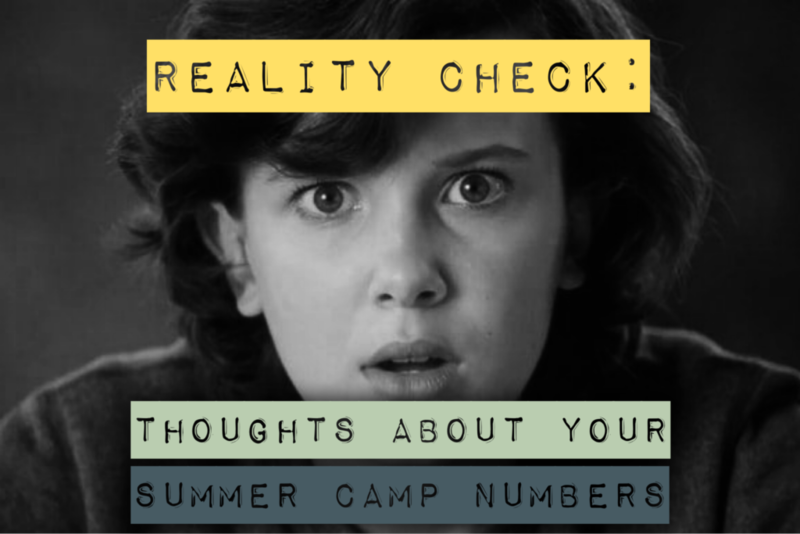 But, for now, I want to focus on something else: a reality check about summer camp numbers. Last summer eleven kids went to summer camp from a club (on average) in the United States. Praise God for the eleven kids who went to summer camp! Yes. Yes. Yes. But, I have a feeling for a lot of us eleven kids feels like “I should have done better.” No. No. No. Let’s talk about the number. Last summer in the US 59,710 YL and WL students attended summer camp from 5,320 “ministries.” That works out to 11.2 campers per ministry. The way averages work is that for every club that brings 20 kids to camp, there is another club that brings 2 kids to camp (22/2=11). If your club brought 2 kids last summer and you know another club in your community that brought 20… together that is a good snapshot of what summer camp looks like for us in the United States. Further, for every club we hear bringing 100 kids to camp and filling up all their spots within minutes, 9 clubs brought 2 kids to camp (9×2=18… 18+100=118 campers for 10 clubs… 118/10=11.8 so actually 6 kids above average). Every leader I know wants to take lots of kids to camp. Every leader I know is continually trying to find new ways to expand our ministry. Every club I know that brought 2 kids to camp last summer is hoping to take more this summer. Every club I know that brought 100 kids to camp last summer is hoping to take more this summer. Here is my point: Part of the reason many of us believe that we are failing is because our data is skewed. I have contributed to an unrealistic picture of YL and WL. When I look back at the pictures I’ve posted and the stories I’ve told, these have been hand-selected to highlight the “biggest,” “best,” and “most successful” things I’ve ever done. For instance, last week we had 3 guys at campaigners. I didn’t post a picture of that. This morning, I went on campus to hand out donuts and I don’t remember (and didn’t write down) any names of kids I met (oops). Right now, I only have two guys with solid deposits in for our summer camp trip. I take responsibility for projecting a consistently vibrant and growing ministry that may have made you feel like you aren’t doing a good job. Please forgive me. Focus on what you can do and not what you can’t do. Focus on the inputs not the outputs of ministry. I just taught a one-week intensive class at a Bible college on incarnational theology. The main point of the course was: you are not God. I taught other important points, but I emphasized how a great concept such as incarnational ministry can become heretical in a blink-of-an-eye when we think we are in charge – when we think we are God (see “The First Commandment” … it is important). Inputs (me, through God’s empowering) = praying, inviting, showing-up. Outputs (God) = attendees, campers, conversions. 1 Corinthians 3:6–7 I planted, Apollos watered, but God gave the growth. So neither he who plants nor he who waters is anything, but only God who gives the growth. You are not a failure. You are God’s beloved. Believe the message we share at camp. Thanks for the reminder that we are to be faithful to what God has allowed us to be involved with. We don’t save kids, we don’t make them go to club, campaigners or camp.